On 31 October, the United Nations General Assembly will vote on Cuba’s annual resolution calling for an end to the US blockade. Resolution 72/4, ‘Necessity of ending the economic, commercial and financial embargo imposed by the United States of America against Cuba’, has been presented annually to the UN body since 1992. In 2017, 191 countries voted in favour of the Cuban motion, with only the United States and Israel voting against. The same result is expected this year. In advance of the vote, Cuba sent a report summarising the impact of the inhumane US policy against the island during the last year. Analysing the twelve months from April 2017-March 2018, Cuba estimates that it suffered loses of $4.3billion in one year alone. Since the blockade was imposed almost 60 years ago, the figure amounts to over £933 billion dollars. The impact of the blockade has been further intensified in the period of the report, due to the new measures introduced by US President Donald Trump in June 2017 which tightened the nearly six decade old blockade. The report outlines in detail the brutal impact of the blockade in Cuba, including its effects on health, education, food, sport, culture and development. The extraterritorial impact of the blockade around the world is also analysed, including several examples from Britain. The case of the Open University’s ban on Cuban students is included in this year’s report – a ban that CSC led a victorious campaign to overturn. The impact of the blockade on special needs schools highlights the island’s difficulty in purchasing Braille machines which are manufactured and sold in the United States. CSC and the National Education Union (NUT Section) have worked together on a campaign to help beat the blockade by sending dozens of Braille machines to special needs schools across the island. In October, Cuba’s permanent mission to the United Nations issued a press release highlighting the extraterritorial impact for the blockade, often described as “the longest economic war in history”. The US treasury has increased regulations to further limit trade between the two countries and restrict the right of US citizens to travel to the island which has seen a 43 per cent decrease in the number of US visitors, equivalent to 51,677 fewer travellers than in the same period in 2017. Online sales of 99 per cent of Gaviota hotels were affected when companies such as Booking.com and Expedia.com, cancelled their business relations with the Cuban company in November 2017. Dozens of banks across the world have ended their relations with Cuba, or foreign companies with ties to Cuba, including preventing Cubans resident abroad from making transfers home. Despite being a driving force for Cuba’s economic growth and exports in recent years, Cuba’s biopharmaceutical sector is unable to generate income through the US market. Telecommunications and the information technology also sector suffer and have hindered Cuba’s ability to expand internet access and wifi on the island. According to the Cuban statement, damages inflicted to the transport sector were illustrated by the difficulties that Cuba’s national airline company (Cubana de Aviación) faces in purchasing or leasing aircrafts with technical components of almost any technology. 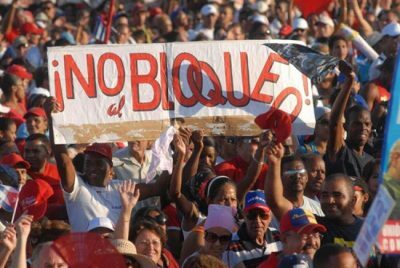 Despite the increasing interest in cultural exchange between Cuba and the United States, the blockade is restricting such links warns Cuba’s mission to the UN. Last year 497 musicians and professionals from the US were prevented from travelling to Cuba to take part in cultural programmes and exchanges. During this time, another 15 groups (300 people) cancelled their visits. Cuban groups travelling to the US were also prevented from receiving income from their performances and US music and distribution companies pulled out of deals with Cuban record companies for feat of being sanctioned by the blockade. In 2016 and 2017, the Havana International Book Fair (FILH) had hosted meetings of publishers, distributors and literary agents meetings to discuss cooperation. The third meeting scheduled during the 2018 FILH had to be cancelled due to new restrictions adopted by the US. Don’t be confused if you see the accumulated cost of the US blockade appearing as different amounts. This is because there are two possible (and correct) ways to calculate it. The figure Cuba uses in its report to the UN – $933,678 billion – takes into account the depreciation of the dollar as compared to the price of gold on the international market. However, if the amount is calculated at today’s prices, the cost of damages comes to over $ 134,499 billion. Download Cuba’s full report to the UN here. Featured image is from CSC.